Use deployment triggers for automatic management of how and when Bamboo starts deployment projects. Note: You can also start deployments manually. When an automatic deployment starts, Bamboo creates a new release based on the latest successful build of the plan branch that is defined in the deployment trigger. If there is only one branch in the plan, it is selected by default. You can customize the deployment by specifying the details of each trigger. Triggers configuration lives in the environment settings of a deployment project. If you don't know where to find the trigger configuration in Bamboo, see How to find deployment triggers configuration in Bamboo. The list of parameters that are the same for all deployment triggers. A meaningful name of a trigger by which you can identify the trigger in the GUI. Select the check box to ignore the trigger in deployments. The list of parameters that are specific for each deployment trigger type. The trigger starts a deployment after a successful build of the specified plan branch. If there is only one existing plan branch, it is selected by default and the branch selection options are hidden. Specifies the branch that must be successfully built before the deployment. Starts a deployment after a successful deployment on another environment. Specifies the environment on which a successful deployment must be performed to start the new deployment. Starts a deployment after a successful build of the specified stage of a plan. If there is only one existing stage, it is selected by default. Specifies the stage on which a successful deployment must be performed to start the new deployment. Starts a deployment according to a customized schedule with artifacts from a specific branch. and provide the further details in the fields displayed following to the selection. Specifies the branch from which Bamboo provides artifacts for the deployment. 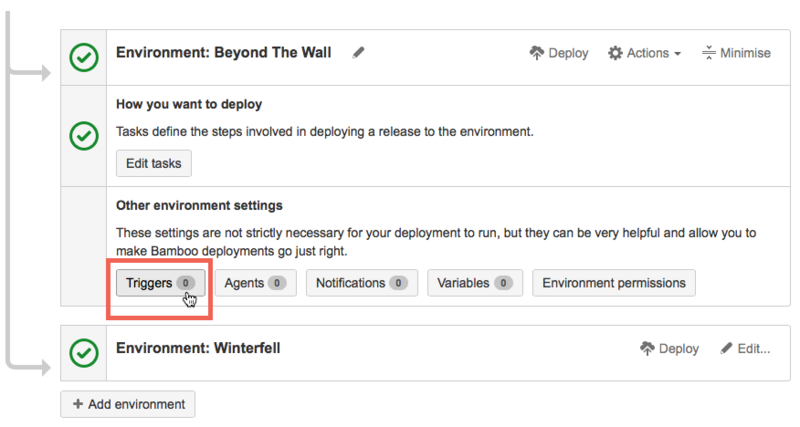 Deployment triggers are set as part of the of the environment configuration for a deployment project. Click Deploy in the top main Bamboo menu and select All deployment projects. Click the name of an environment to display the environment details view. Once you are in the environment edit view, a list of all existing environments is displayed with expanded information about the environment that you want to edit. In the Edit triggers you can add, remove, or configure triggers.